Michael S. Gardner is comfortable in the dark, and he takes the reader with him to search the shadows for sparks of fear. 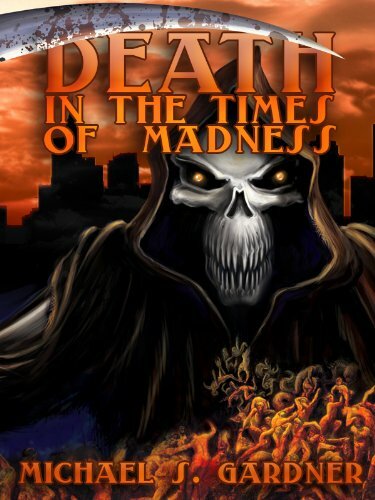 Death in the Times of Madness is a short story collection consisting of many stories, the majority of them zombie related. I would have liked to see more diversification, but if you like zombie stories, I’m sure there’s a tale or two in this collection that you’ll enjoy. Some of the shorter stories, I would have liked to see fleshed out a bit more. Some didn’t feel complete to me. My favorite story, by far, in the collection was Don’t (My Buddy Benny). The story was so clear and made you hate one of the characters and want slap some sense into him. The story is about a man (an older man, a veteran) who is prepared to stay in his house if something should happen to bring the world to its knees. A family shows up on his doorstep and he allows them entrance, for the sake of the woman and child. The man of the family just can’t handle staying put, where it’s safe. Loving him, his family is compelled to follow him. This leads to all kinds of danger and pain for the family. That’s all I’m going to tell you because I don’t want to ruin the story for you. There were minor grammar issues, but nothing so bad as to ruin the book for you. I give the book: 2 QUILL. This entry was posted in 2 Quill, Adult Horror and tagged 2Q, Adult Horror, horror, Michael S. Garnder, zombies. Bookmark the permalink.